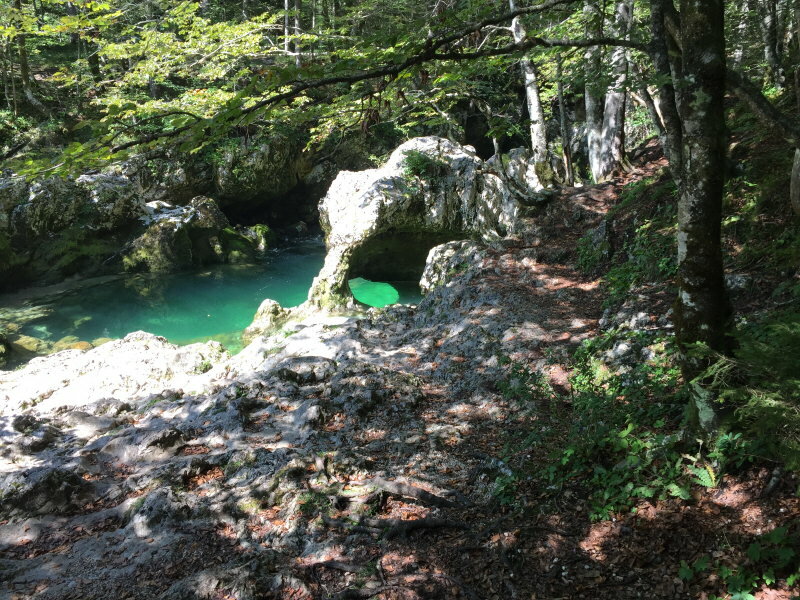 Pure Nature in Slovenia, shaken in a cocktail of adventure! 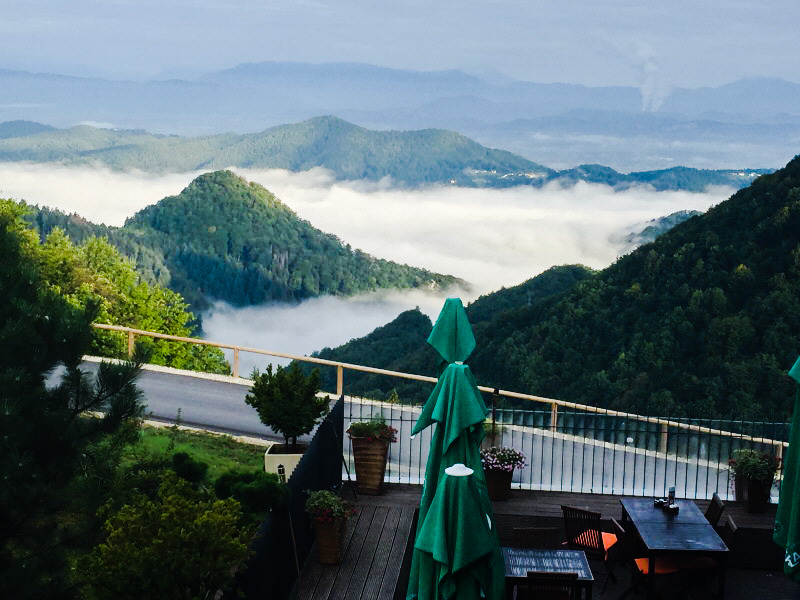 In just 2 hours from the UK, often costing less than £90, you can find yourself in Slovenia, mixing with peace-loving, nature-conserving folk living in a scenic paradise and an ambiance reminiscent of a bygone era. I only hear about Slovenia nowadays during their performance in the Eurovision Song Contest so when I was given the opportunity to visit by Best Press Story, curiosity prevailed. The Republic of Slovenia was recognised as an independent state of the former Federal Yugoslavia in 1992 and is situated in Central Europe, bordered by Italy, Austria, Hungary, Croatia and the Adriatic Sea. Occupying 20,000 km² and with a population of just over 2 million, it is perhaps a lesser-known member of the United Nations, European Union, and NATO. As a UK child of the ‘70’s I had been lucky enough, through family circumstance, to live in the then Czechoslovakia and regularly visited neighbouring Eastern Bloc countries. Little did I know I was actually witnessing the final years of the cold war. I say “lucky” because although words like “war” drum up visions of violence, aggression, depression, hatred and death, all I witnessed was a warm, close, family-orientated community of loving people valuing themselves and their spectacular environment. To my nostalgic surprise, not only has this culture not been lost, but is as powerful as ever in Slovenia where you could easily drown in its infectious tsunami of humankind. Warm smiles and a genuine interest in your presence welcome you wherever you seem to find yourself when exploring this magical, mystical land. 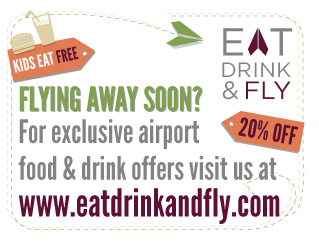 This is amplified by the exceptional value for money where you can still enjoy a decent coffee for under £1 and an ice-cold beer for under £2! The chances are you’ll be served by a noticeably happy and proud national who will politely collect payment using what looks like a bus conductor’s purse with coinage neatly separated by some sort of spring-loaded tubular mechanism! Delightful! Celje koča & Adventure Park is a resort nestled in the mountains that surround the ancient Celtic City of Celje, with its superb 12th Century castle built by the Counts of Heunberg. You won’t go far wrong taking a stroll through the twisting streets with a visit into the castle where legends abound and the castle cat will purr you in! The adventure park provides adrenalin seekers with a tree-top rope course where you’ll definitely question yourself “why am I doing this?” as you navigate the seemingly impossible challenges that monkeys address with such ease and agility. Then there’s the bob cart summer toboggan run where you’ll whizz down 800 meters of stainless steel half-moon track at break-neck speeds! 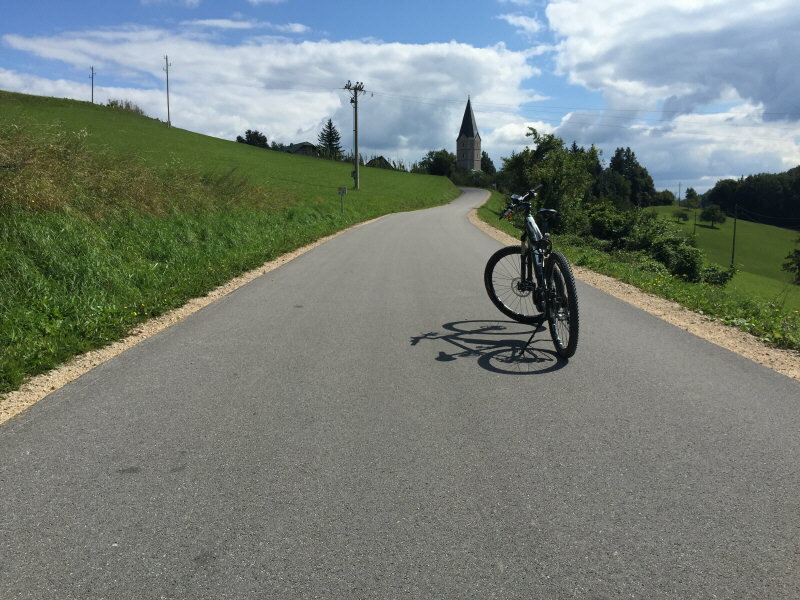 To top it all off, a stroll into the surrounding woodlands followed by a scenic ride on one of the electrically power-assisted bikes will return your heart to a normal beat – although the stunning scenery may still stimulate the odd adrenalin overdose! Ever heard of it? Supping? Me neither but it is, apparently, the fastest emerging “sport” in Slovenia. 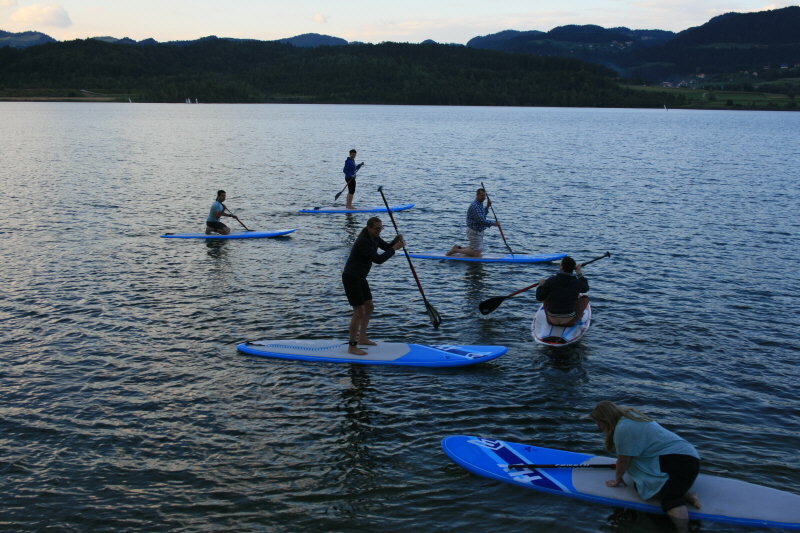 Velenje Lake is a spectacular place to have a go but be warned, balance and a love of getting wet is compulsory as you (attempt to) stand on a giant surf board and punt your way gracefully (not) across the lake! 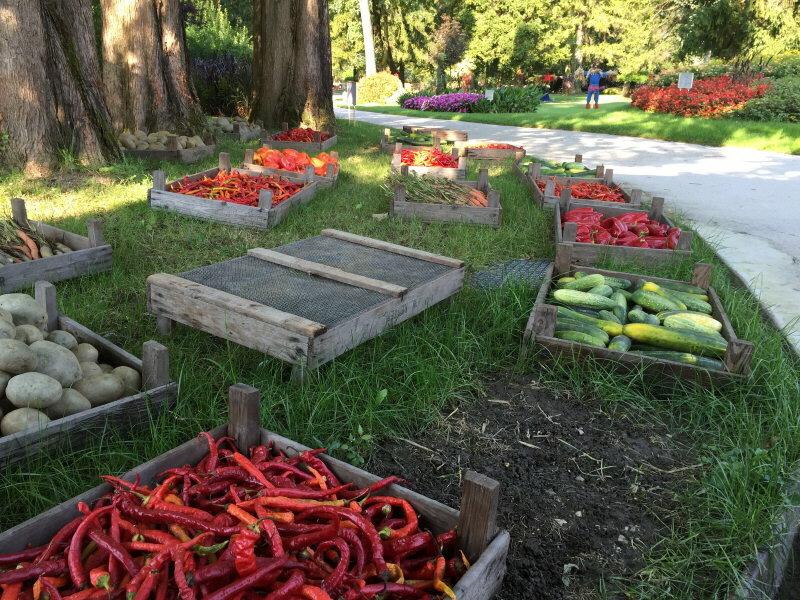 Velenje itself is a well-worthy stop-over, if only en-route, as Slovenia’s fifth-largest City and home to the largest statue of Tito, the Yugoslav revolutionary and statesman until his death in 1980. Mozirje is a gem of a town where locals live in a harmonic balance with the mountains and water. Don’t miss the amazing flower park where incredible bloom “sculptures” can be seen year-long neatly hiding a quaint chapel dedicated to St. Valentine and all the lovers who’ve said “I do”. I was told that Slovenians are pretty good at massage and this was my moment to test out the theory. Staying at the apartment house SKOK Mozirje provided a pampering crème de-la-crème opportunity in its sophisticated beauty studio where sipping champagne in the Jacuzzi followed by learning about muscles I didn’t know I had convinced me it was true! 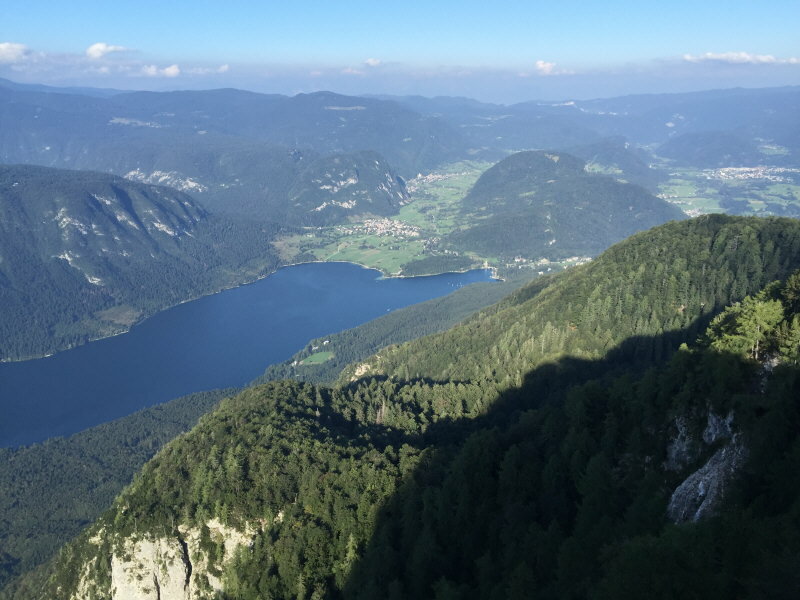 Refreshed and recharged it’s back to the great Slovenian outdoors where Camp Menina is well placed with its own lake for swimming and water sports, playing fields, fishing opportunities and even an Indian Village to entertain. 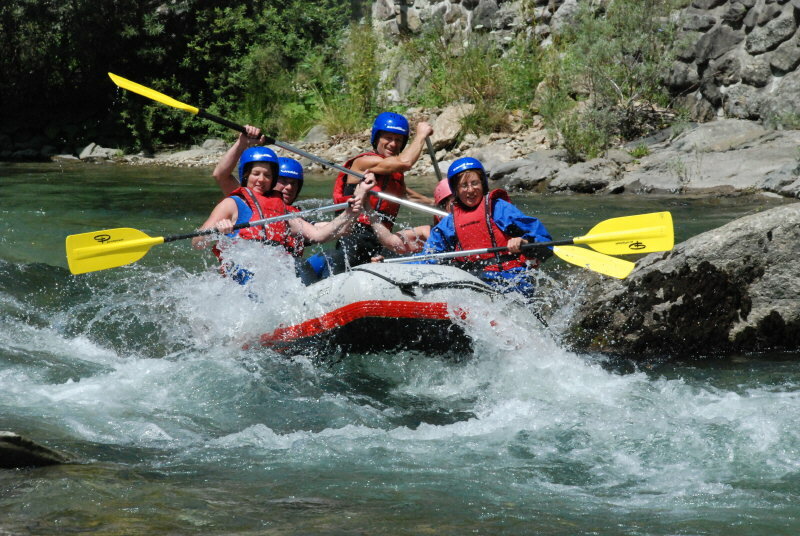 If it’s adrenalin you’re after then perhaps one of the white-water rafting experiences on the local Savinja River will satisfy your thirst? No? Then try the paragliding instead! You’ve got it all here and at prices that reflect Britain in the 60’s you may as well tick those “things to do before I die” boxes now. You won’t go far wrong opting for an afternoon’s drive through the Logarska Valley – an impressive roller-coaster feel road trip showing Slovenia off in all her glory! The route will take you through the Municipality of Solcava where the Rinka Centre can be visited, a focused visitor centre encouraging the sustainable development of the Solcavsko region. From here a visit to the Palenk and Rinka waterfalls are a must, followed by a breath-taking drive along the high Panorama Road to Na Klemenčem, with its incredible view point as well as a short walk to the Kisla (Bitter) Water Fountain. Tasting is essential if you seek eternal youth and never-ending fertility. To finish off this pure nature day why not consider staying at a real under-the-stars campsite? To some it will be romantic; others nostalgic. For me it was, erm, rustic at the NaturPlac Na Škali near the village of Ljubno ob Savinji. It’s home to several nifty wooden shelters (originally called “kočure”) with tents nestled within. They looked (and probably felt) like giant chicken coops. It was certainly different. The site owners and hosts were incredibly friendly and cooked a delicious locally-caught fish dinner to the ambience of a crackling camp fire beneath the stars and the odd chord of someone trying out the resident guitar. The next morning witnessed an equally impressive breakfast with a real awareness of the crystal-clear river gushing past the outdoor communal dining table. If you’re into camping, I dare say it simply doesn’t get any better than this! If someone asked me what a disappearing lake was I’d assume they were referring to a Las Vegas style illusion. However, this is far more impressive! Near to the village of Zeleni Kras you can, literally, watch the Cerknica Lake in the Notranjska Regional Park disappear right in front of your eyes in less than 15-minutes. So-be-it a lovingly made humongous model in a Perspex case with an audience of 25 sitting around it in awe. Don’t worry though! You also get to see the real thing a short walk away and it might have water within, or it might not. Either way, it’s a fun thing to see, do and learn about so don’t miss it! Fancy watching a wild bear in its native habitat? 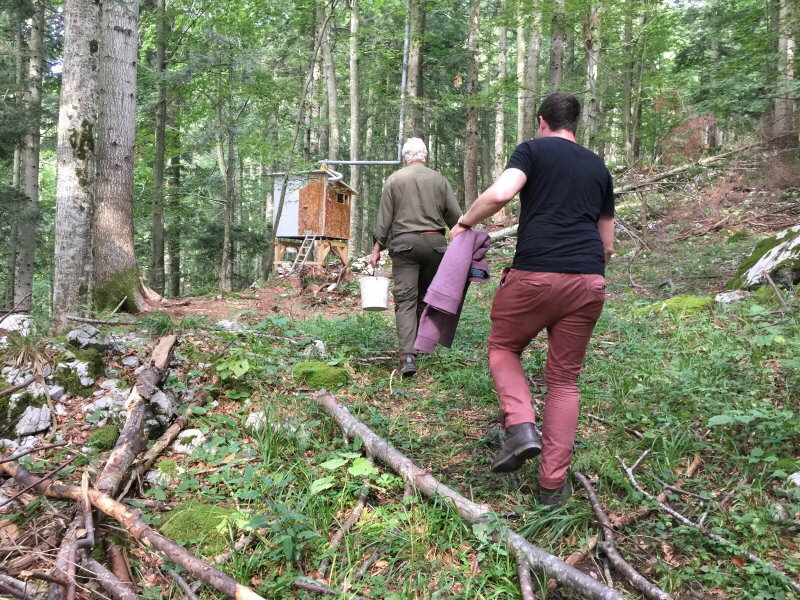 I did too and was delighted when my hosts at the Mlakar Guesthouse, with their years of experience organising bear observation trips, offered to try and show me some in the local Green Karst forest. The bear represents the essence of untamed nature and to see one is really special. I can verify this because see one I did. In fact, it came within just 5 metres of the wooden observation hut I was sitting. At one point I could hear it breathing and grinding its teeth on the rocks. Had I not known better, I would’ve been quite nervous of intruding on this forest king’s environment but I doubt he knew I was spying on him as the only sound I made was my own heart beat pounding with each closing step the bear made. I had the pleasure of his company for over 90 minutes and then he performed the greatest cliché of all – but you’ll need to watch my video for that! Well, “lake deep” anyway! With two impressive glacier-formed lakes to visit you’ll be spoilt for choice, but as they’re only a 30-minute drive apart you may as well experience them both. 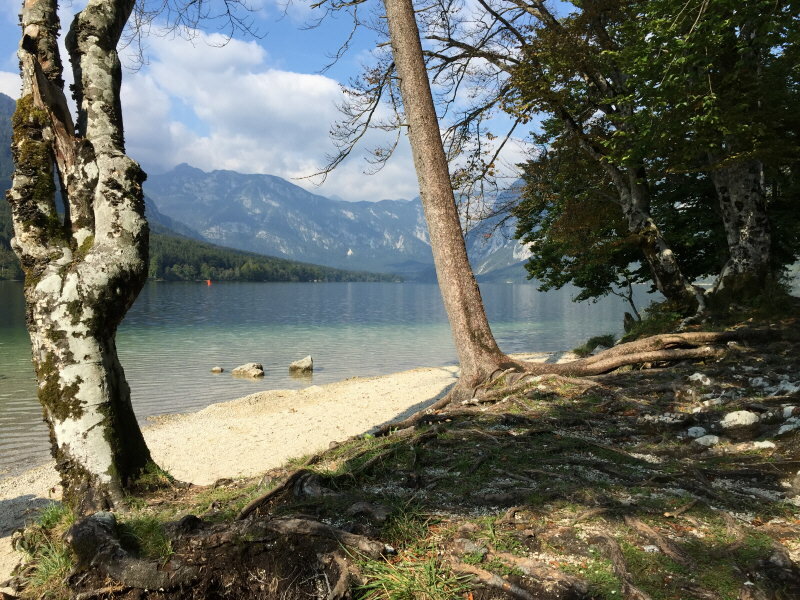 Lake Bohinj will treat you to an impressive mix of lakeside architecture, wildlife, fish, forest and mountains, especially when viewed from aboard one of their 2 operator guided boat trips. 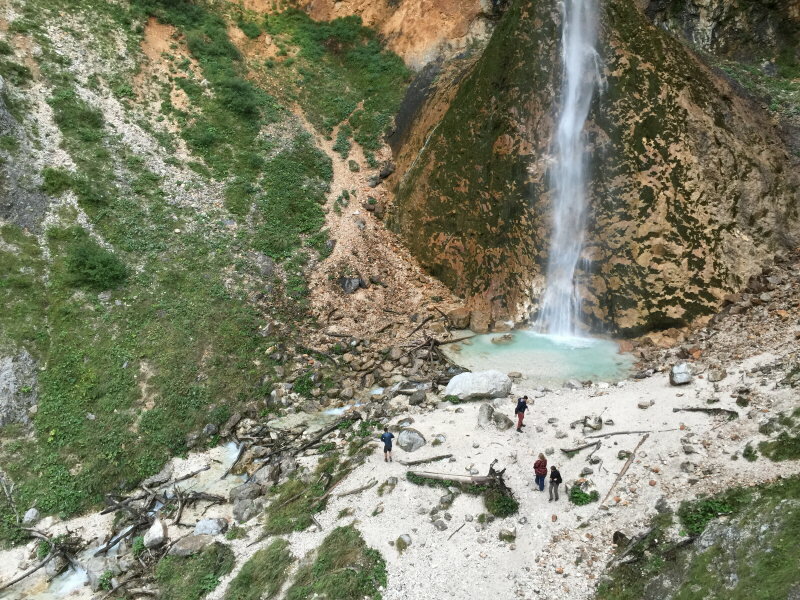 For the energetic you might want to attempt the 12km / 5 hour hike around the lake but for those a tad less ambitious try the hidden gem of the Mostnica Gorge climaxing after a 1km stroll with its 20-metre high waterfall below Mt. Tosc. It can’t but impress and you’ll also be treated to a spectacular view of an “elephant”! 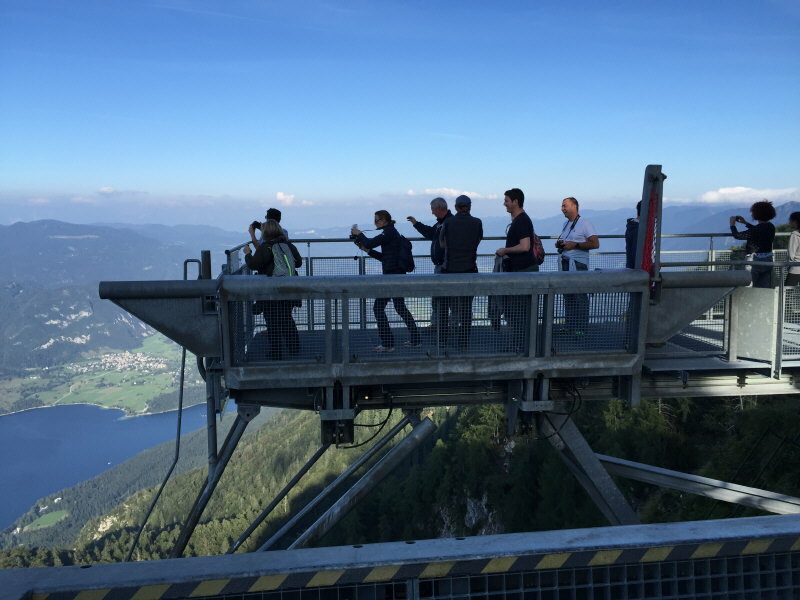 Get a real bird’s eye view of the lake and surrounding peaks by ascending to the Vogel ski-resort with the Rjava Skala cable car that whisks you to 1,540meters in under 10-minutes! The views are stunning and with plenty of facilities (including free wifi) there’s no rush to descend! Lake Bled provides a tranquil serenity charmed by the graceful ‘pletna’ boats. The delicious and calorie-free (erm, really?) not-to-be-missed Bled cream cakes, baked since 1953 when the original recipe was invented, will titillate your taste buds. Ever considered glamping? Me neither but I have to be honest, it was fun! 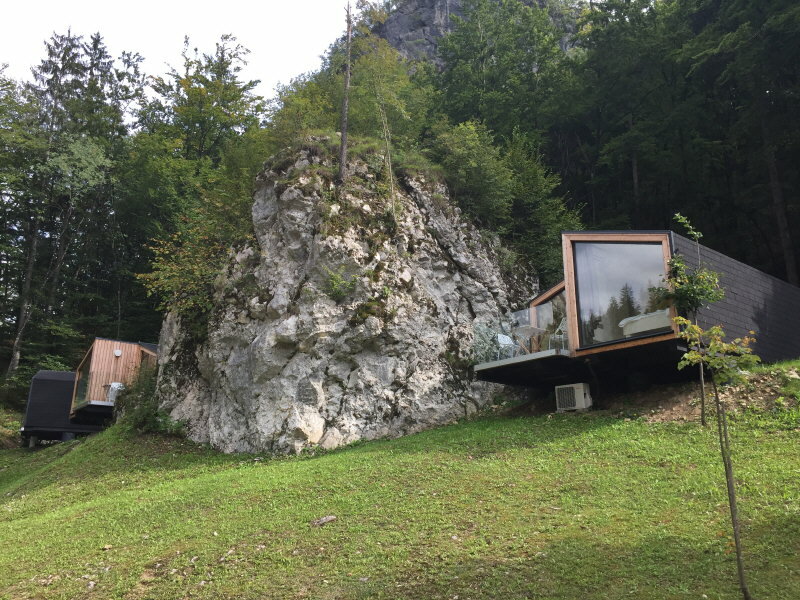 Camping Bled provides 24 de-luxe wooden mini-cottages within its eco village. Each has a double bed and a private (separate) bathroom. A further pleasant and welcome feature is each also has its own private outdoor hot tub with a real wood-burning stove warming the water. I was told it was “ideal for couples” but I had a great time alone too, although a partner would certainly been nice! A beautiful well-stocked and prepared picnic basket was delivered outside for breakfast and all-in-all I think I might’ve got the bug as I find myself with a burning desire to return to this idyllic haven of pure nature. There’s something special about Laško’s thermal springs. At least that’s the ancient rumour. That’s why Laško Thermal Spa Resort, a modern health tourism centre emerged. 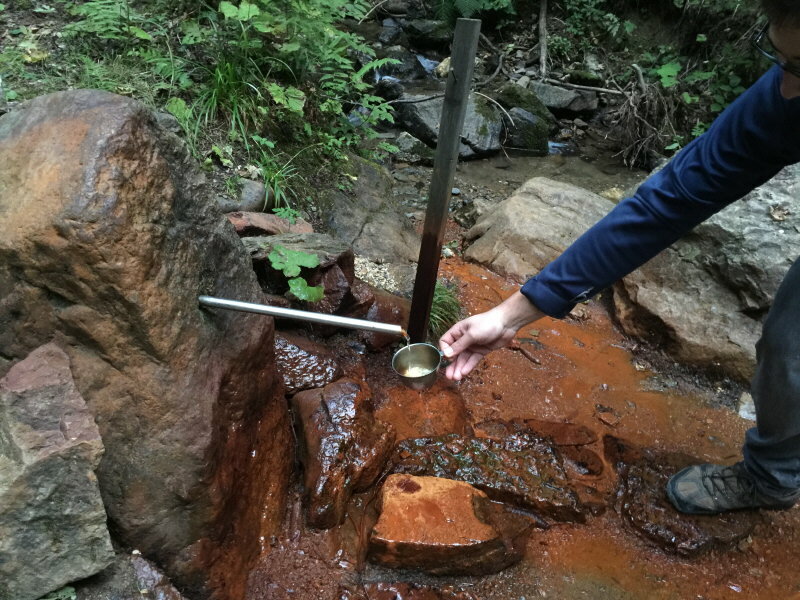 Many believe the thermal water helps them regain health and maintain their well-being. Whatever you believe, you won’t go wrong pampering yourself in this splendid resort whilst spending some time in Laško town itself. Whilst there, don’t miss exploring the historical beginnings of Slovenia’s most famous beer, Pivovarna Laško, dating back to 1825. 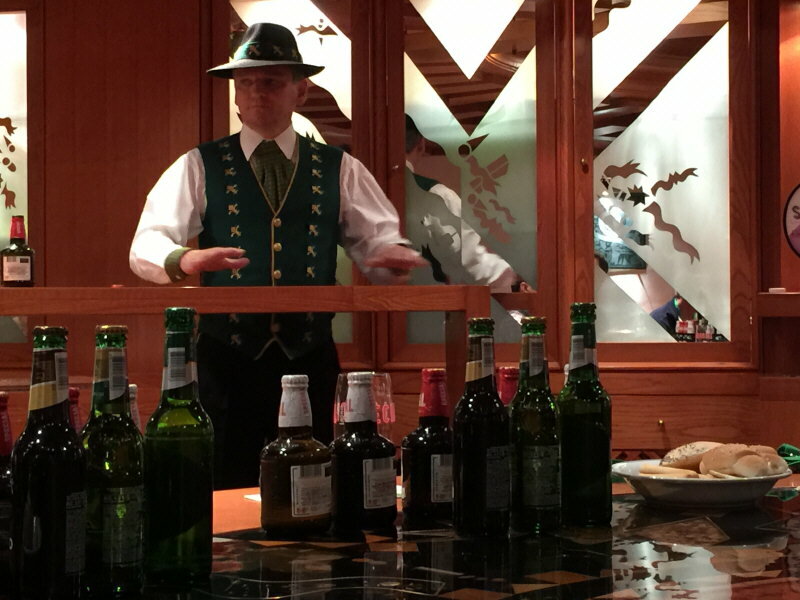 The Laško Brewery tour demonstrates the process of beer brewing concluding in sampling the finished products. I don’t remember much more about this place after gulping the 14% super-brew! I have over the years been very close to Slovenia with visits to Austria, Hungary and Italy but never actually made it over the border but after reading your feature that is about to change this year! Slovenia here I come!